Mix together all the ingredients for the dry rub. Drizzle the juice and zest of the lime all over the meat and rub until the meat is wet with the lime juice. Rub the dry rub all over the meat, making sure to coat all sides of the meat well. 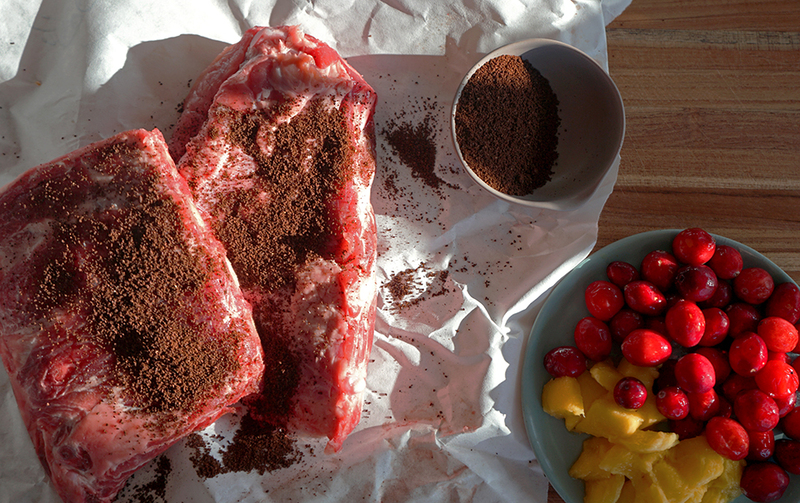 Place the rubbed meat in the refrigerator for at least one hour and up to 24 hours. Heat a deep and wide heavy bottom pan (a Dutch oven is great) with the oil to medium high heat . Sear the ribs in the pan a few at a time, cooking on each side several minutes until deeply browned. Working in batches until all the ribs are browned. Place the browned ribs on a plate and put aside. Reduce the temperature to medium and add the onions and garlic and cook for about 2-3 minutes. The onions will become translucent and start to brown. Add the cranberries and mangoes and stir. Using a wooden spoon, make sure you scrape the bottom of the pan, to get all the browned bits stuck to the pan from browning all mixed in. Cook, stirring for a few minutes and add the beer or cider. Add the ribs back into the pan and bring to a boil. Reduce heat to a simmer, cover. Allow to simmer on the stove cooking, making sure to stir every 20 minutes or so. Each 20 minutes, for the first two hours, add another ½ cup of water. Cook for about 2.5 -3 hours in total until meat is tender and falling off the bone. If you need to add more water, you can add in ¼ cup increments each 20 minutes. You want to end up with about an inch of thick liquid at the end of cooking. Serve the short ribs over mashed cauliflower with drenched in the sauce!